I traditionally go out for Japanese food on my birthday. For my 26th birthday I decided to change this tradition and go out for Thai food upon hearing of Bon Appetit’s best new restaurant nominee, Kin Khao. The meal here lived up to the hype and did not disappoint! Owner Pim Techamuanvivit and chef Michael Grimes serve up authentic Thai dishes made with seasonal produce and sustainably raised or caught meats. They are unafraid to experiment with flavors unfamiliar to the American palate and with varying levels of heat. As soon as you walk into the restaurant, the strong aromas tantalize the senses and promise a delicious meal. Less greasy than other Thai restaurants, Kin Khao also manages to arouse all five of the fundamental taste senses. The burnt eggplant salad perfectly encapsulates the essence of the restaurant as it relishes in sweet, spicy, umami, sour, and salty flavors, in addition to a hint of smokiness. Paired with a Singha, there are no wrongs with this dish. Next we tried the Chilli Jam Clams, which are Cherrystone clams in a saucy Khun Yai’s Chilli Jam and Thai basil broth. You could see the Red Chilis interspersed throughout the broth- based shell dish. Another deceptively spicy starter was the papaya salad. The shredded green papaya had green beans, cherry tomatoes, dried shrimp, garlic, peanuts, lime, fish sauce added to it. Again, what is ostensibly a simple salad is actually layered with complex flavors attributed to so many different ingredients being added. As a tribute to the forested mountains of Northern Thailand, we had to try the Northern-style Khao Soi Gai, which is a chicken curry broth with egg noodles, pickled mustard greens, and spicy chili oil. Rice, a staple to Thai cuisine (as it is with other Asian cuisines) is the primary starch of any meal. Even in this dish, you will find that the noodles are rice-based. Paired with an assortment of additional pickled condiments and sauces, there is so much going on with this dish that every bite is unique. Far from being a homogenous dish, I would like to try this over and over to get a different taste bud experience! We finished the meal off with one of my favorite dishes that I ate when I traveled in Thailand, Khao Mun Gai. After long and exhausting train rides, for $1 I would buy this dish from street vendors and instantly repel myself back to a state of equilibrium. Thailand has a reputation for having the cleanest and safest hacker food in Asia, and truth be told, I had no stomach issues for the three weeks I traveled around there. Translated into English, this dish is chicken fat rice. Yes, it is called FAT RICE and every bite of it is delicious. 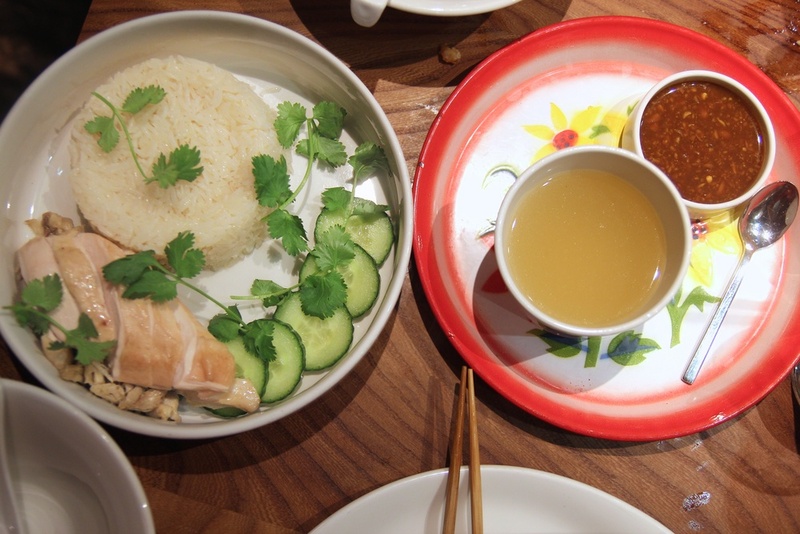 The ginger-poached chicken, with the skin on, is served with Pim’s secret sauce and a robust chicken consommé. Of course, taking an already delicious recipe and adding fresh and clean ingredients, this is the best rendition of this dish that I have ever tasted. What a wonderful birthday treat!